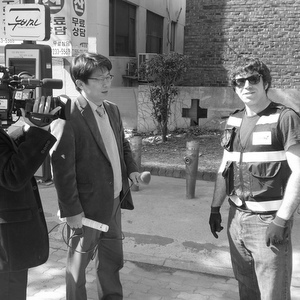 In Changwon, “Environmental Capital of South Korea,” Colin Marshall talks with Coby Zeifman, former outreach coordinator for Nubija, the city’s bike share system. They discuss what makes Changwon a cool town; why a feature like Nubija, despite its impressiveness, needed the kind of outreach he has tried his utmost to provide; Changwon’s history as a manufacturing town for the conglomerate LG; what makes it a “Young City,” including its plan modeled after Canberra; how the city expanded, and how Nubija expanded along with it; how he got to Korea in the first place, on nothing more than the advice of two friends who already lived there; how “livable” he found Changwon even at first; what makes Nubija inconvenient for foreigners; why so many services in Korea require a Korean cellphone; how Changwon’s Nubija compares to Daejeon’s Tashu; when he started to get the sense that he could not use Nubija, but contribute to it; how he began Changwon Bike Party (by “Tyler Durdening it”); where he’s gone with the Bike Party he might not have gone otherwise; the scrutiny he underwent before Nubija let him help out; his experience learning bicycle repair, a subject he didn’t know well, in Korean, a language he didn’t know well; what Nubija’s “smart” information technology architecture does for the system; whether Seattle, where he came from, has got ready to become a 21st century; the glories of the T-Money card; the assumption that certain public conveniences “wouldn’t work in America”; Mia Birk‘s theory of shining a light and scattering the cockroaches; what we can learn from New York City’s solution to graffiti in subway cars; his imminent return to the United States, and the reverse culture shock for which he has prepared himself; his hopes for sustained carless “freedom and happiness” in America, and the multimodalism that still requires; how Korea’s cycleability ranks overall; and what it takes to complete the country’s Four Rivers Tour and receive the best souvenir of all of his time in Korea. This was written by Colin Marshall. Posted on Sunday, February 22, 2015, at 11:15 am. Filed under Changwon, Korea, Notebook on Cities and Culture. Bookmark the permalink. Follow comments here with the RSS feed. Comments are closed, but you can leave a trackback.